Further to our announcement in 2004 that the bar and restaurant areas of Portmeirion's Main Hotel building (which doubled as "The Old People's Home" in "The Prisoner") were being refurbished, we are delighted to today provide images of the new rooms in our Village Update section. 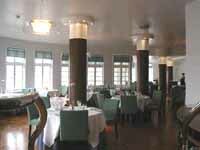 The restaurant and bar were both re-designed by Terence Conran (of Habitat fame) and were re-opened in late January. The inspiration for the new restaurant came from Sir Clough's original intentions for the interior - that of a 1920s Ocean Liner, whilst the bar has a more Conran-like minimalist feel than the old Jaipur Bar, with new furniture (including some very comfy armchairs and archive Portmeirion photographs) added. Other improvements and refurbishments have also taken place in Portmeirion recently, details (and many exclusive images) of all of them can be found in our Village Update section, as well as images from the Hercules Hall Antique Fair (running February 25th to 28th).